This Trailer features a HUGE rear bunk area, 2 slide-outs, and only weighs 7,622lbs! This unit comes equipped with 13,500BTU Air Conditioning, Power Awning, Microwave, TV Antenna, AM/FM/CD Player w/ Exterior Speakers, 6 cubic foot Gas/Electric Refrigerator, 6 Gallon Gas/Electric Water Heater w/ DSI, Ducted Furnace, Oven w/ Range, Diamond Plate Rock guard, Stabilizer Jacks, and Spare Tire. 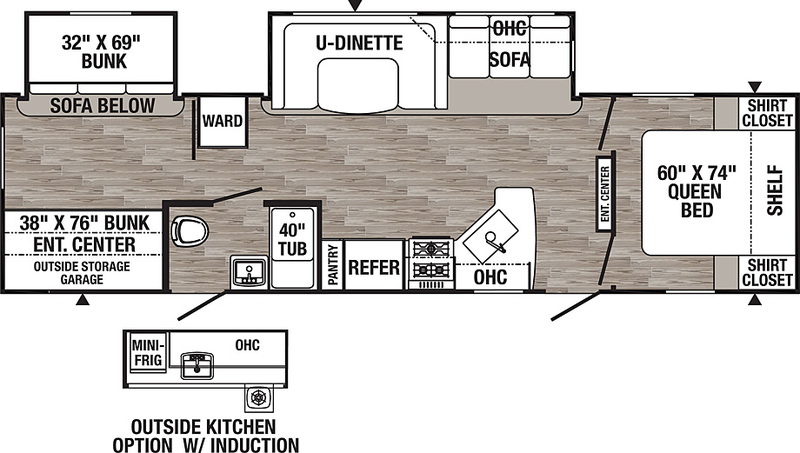 Features a small outside Kitchen w/ Electric Induction cook top, Sink, and 110 Refrigerator!